A new team is now at the helm of this archetypal sixteenth-century hostelry in the charming village of Lower Quinton, just 15 minutes drive from Stratford upon Avon. 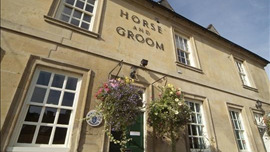 Michael and Marilyn Herdman run the pub as a family affair with help from their siblings and relatives, and have re-established it as the kind of 'proper pub this Cotswold village deserves'. The bar is a classic, get-together room, with old beams, rough stone walls and a log fire providing the backdrop to ale drinking, darts, dominoes and quiz nights in winter. The lounge and restaurant (complete with views of the village church and thatched cottages) are equally traditional; otherwise eat out in the walled garden amid the jasmine and honeysuckle when the weather allows. One menu applies throughout the place, and it's a mix of pub standards (garlic mushrooms, lasagne, bangers and mash) with more ambitious daily specials along the lines of poached salmon with watercress sauce, char-grilled chicken breast with white wine and tarragon sauce, and a mighty mixed grill. Wednesday night is 'fish night'.